29 Jan Is Your Website ADA Compliant? The federal Americans with Disabilities Act (ADA) requires certain businesses to make accommodations to people with disabilities, including such measures as wheelchair accessibility to physical locations, access to service animals and the use of braille. In addition to these physical considerations, Title III of the ADA requires businesses to maintain an accessible website. What does that mean? The answer is not exactly clear, but these guidelines should help you get started toward building a truly accessible website, avoiding any penalties associated with the ADA and making your business more inclusive. Which businesses are required to comply with the ADA? The first thing to understand about the ADA is which businesses are required to comply. Under Title I of the ADA, any business with at least 15 full-time employees that operates for 20 or more weeks every year is covered by the law. Under Title III, businesses that fall into the category of “public accommodations,” such as hotels, banks and public transportation, are also required to comply. That means the entirety of the law applies, from physical considerations to digital accommodations. When it comes to business websites, there are no clear rules. That doesn’t let businesses off the hook, though; they still must provide an accessible website that takes into account users with disabilities. What’s the best way to build an ADA-compliant website if there isn’t a clear definition of what that means? There are a few actions you can take to set you on the right path toward ADA compliance, or at least help you demonstrate that your business has made a good-faith effort toward accommodation, should you ever wind up in court. Accessibility of a website means ensuring that individuals who are blind, deaf or who must navigate by voice are still able to meaningfully engage with the content on your website. This can be done in many ways, including some that are not immediately obvious. All in all, totally revamping a website to be ADA compliant could come with a hefty price tag, possibly up to $37,000, but it insulates your business from being targeted by lawsuits. In lieu of any regulatory guidance, business owners should consider looking to the regulations that govern federal agencies’ websites and related case law to gain an understanding of what compliance might be. There are risks related to the uncertainty of building out an accessible website ahead of regulatory guidance, but it could protect businesses once regulations are established. Create alt tags for all images, videos and audio files: Alt tags allow users with disabilities to read or hear alternative descriptions of content they might not otherwise be able to view. Alt tags describe the object itself and, generally, the purpose it serves on the site. Create text transcripts for video and audio content: Text transcripts help hearing impaired users understand content that would otherwise be inaccessible to them. Identify the site’s language in header code: Making it clear what language the site should be read in can help users that utilize text readers. Text readers can identify those codes and are able to function accordingly. Offer alternatives and suggestions when users encounter input errors: If a user with a disability is encountering input errors because of their need to navigate the website differently, your site should automatically offer recommendations to them as to how to better navigate toward the content they need. Create a consistent, organized layout: Menus, links and buttons should be organized in such a way that they are clearly delineated from one another and are easily navigated throughout the entire site. There are other ways businesses can create an accessible website for users with disabilities. Consulting with an attorney that specializes in disability law is a must for businesses concerned about ADA compliance, but if you’re looking for a place to get started on your own, reading the ADA requirements is an important first step. Failing to comply with the ADA means your business is susceptible to lawsuits, and it’s common for attorneys to seek out non-compliant businesses both in the physical and digital space. According to Engelhardt, the costs of an ADA lawsuit can add up quickly. Beyond regulatory consequences, failure to provide accessibility to users with disabilities means losing out on business. If users cannot navigate your website, you might be missing opportunities to make sales. Further, even if you’re not missing out on sales, ADA compliance makes it easier for search engines to crawl and index your website, pushing it up in the rankings and getting your website in front of more users. 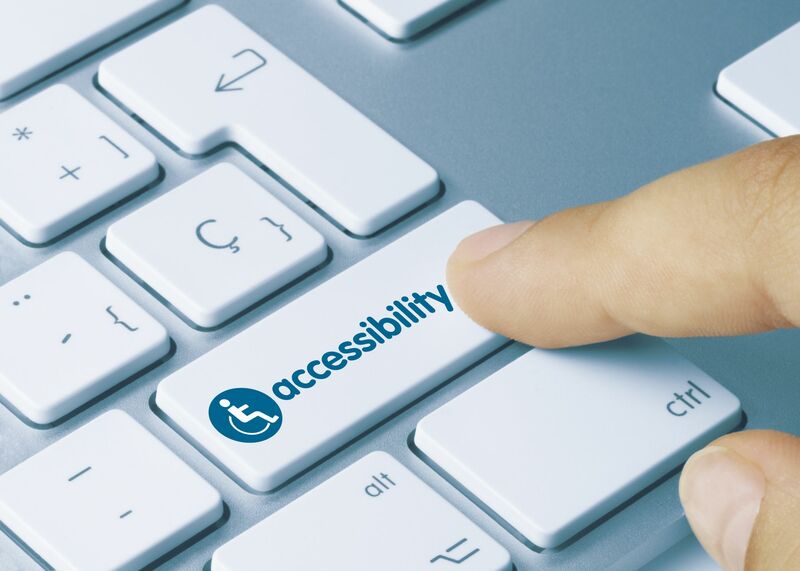 While regulatory guidance for website compliance with the ADA for businesses does not currently exist, it’s not too difficult to discern what is meant by “reasonable accessibility.” By making a good-faith effort toward achieving reasonable accessibility for users with disabilities now, businesses can get ahead of the regulatory curve and avoid potential lawsuits moving forward. Moreover, designing an accessible website can lead to more sales and better ranking on search engines for a modest investment. To find out more about the ADA and how your business can comply, consider reading the law or consulting with a disability attorney.